No two species have a more tangled, more intimate and more shadowy set of relationships than Homo sapiens and Canis lupus. Please help save our brother and sister wolf. owned by Cry of the wolf. "The Wolves of Dawn Circle"
Are you a sister or brother of the wolves? Join us! owned by Dakotasnow's Cry of the wolf. 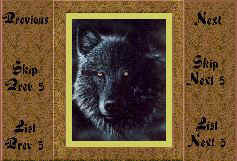 This Hug A Wolf Ring site is owned by Dakotasnow .